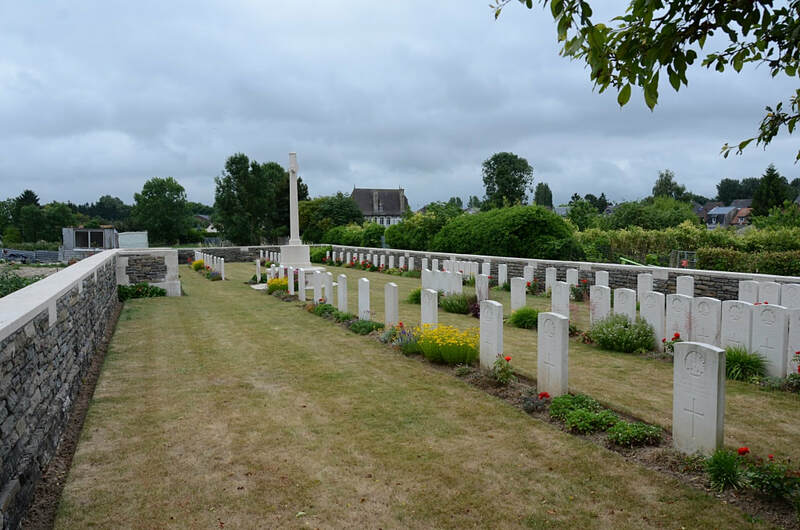 Bapaume is a town 22 kilometres south of Arras and 26 kilometres south-west of Cambrai. 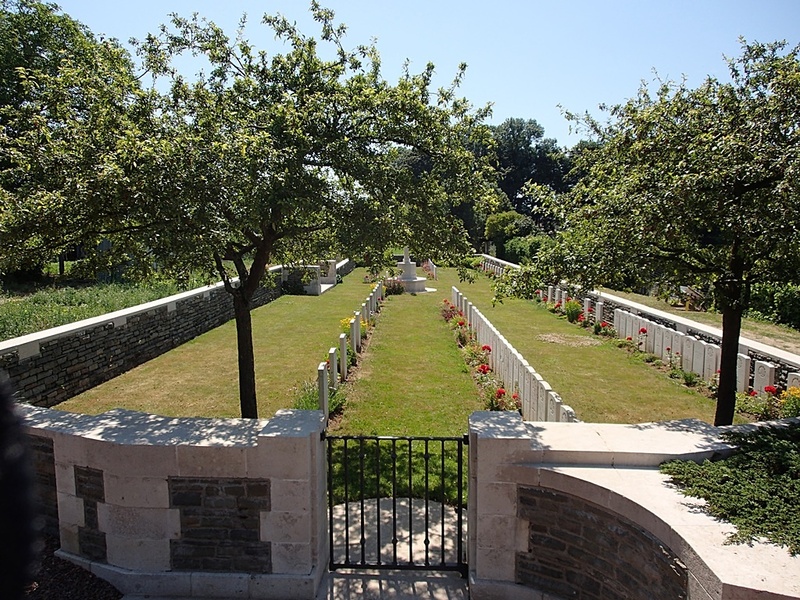 The Australian Cemetery is in the Rue du Chemin Blanc. 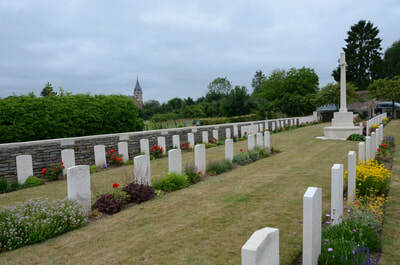 Travelling through Bapaume in the direction of Peronne, the cemetery is signposted before leaving the town. The signpost points towards the prostrate statue of Abel Guidet and the Rue du Chemin Blanc forms the angle with the High Street. In front of the entrance to this cemetery, the roadside verge is steep. 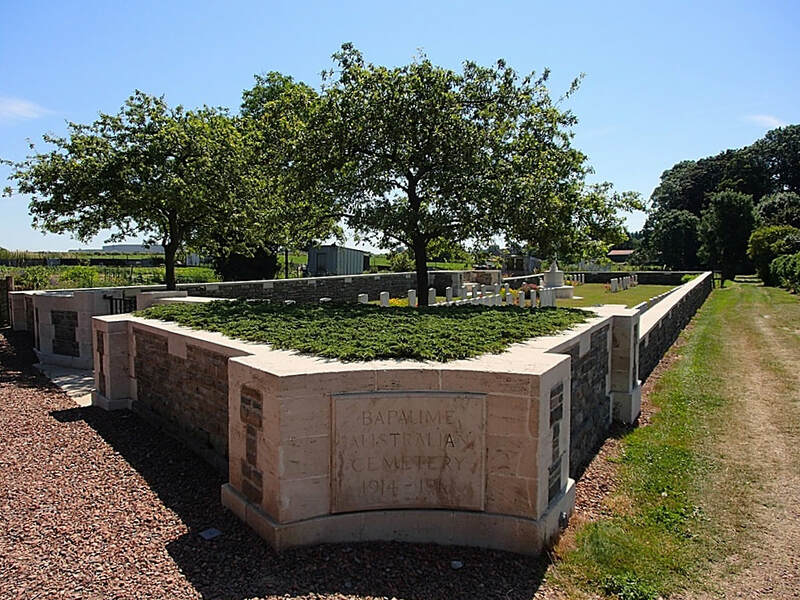 Bapaume was occupied by German forces on the 26th September, 1914, and by the British on the 17th March, 1917; it was retaken by the Germans on the 24th March, 1918, and by the New Zealand Division on the following 29th August. 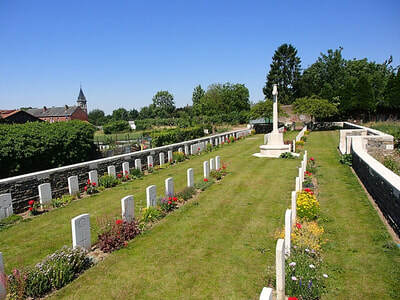 It has given its name to the battles of the 24-25th March, 1918, and the 31st August to 3rd September, 1918. 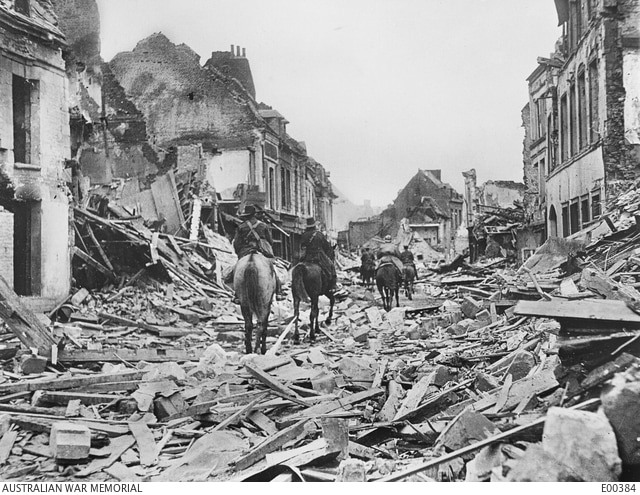 It was severely damaged by both sides during the War. 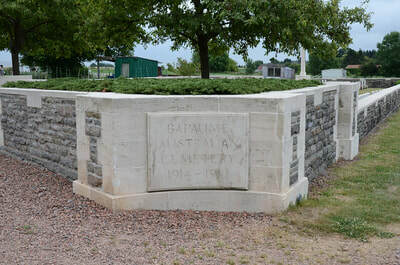 Bapaume was later "adopted" by the City of Sheffield. Bapaume Australian Cemetery was begun in March, 1917, by the 3rd Australian Casualty Clearing Station and used until the following June, and in April and May, 1918, 23 German graves were added to Row C.
The cemetery covers an area of 542 square metres and is enclosed by a rubble wall. 3rd Coy. 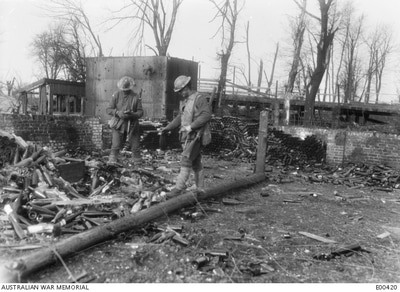 Australian Tunnelling Corps. 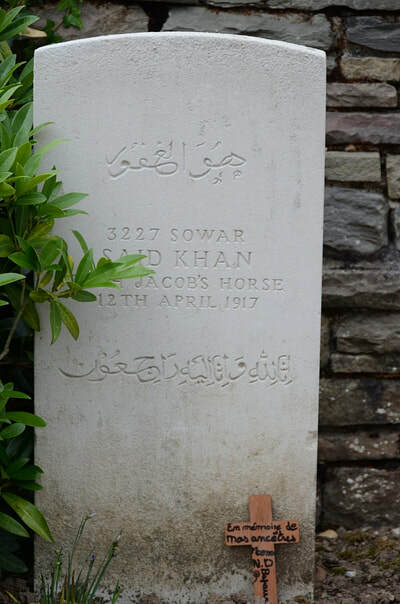 26th April 1917, aged 40. 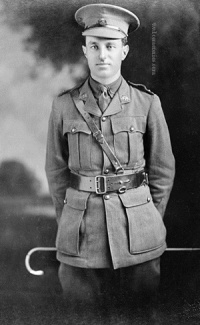 Son of Henry and Jane Bone; husband of Ada Selina Bone, of 33, Wangaratta St., Richmond, Victoria. Native of Clunes, Victoria. 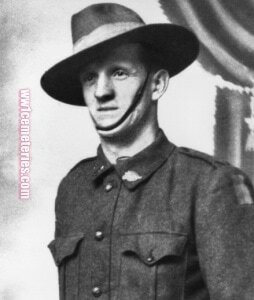 A miner, of Richmond, Victoria, he enlisted on 10 January 1917 and embarked from Melbourne aboard RMS Omrah on 17 January 1917 for Devonport, England. He proceeded to France to join the 1st Anzac Entrenching Battalion on 15 April 1917. Spr Bone died of illness on 26 April 1917 at Bapaume, France. He was aged 40 years. 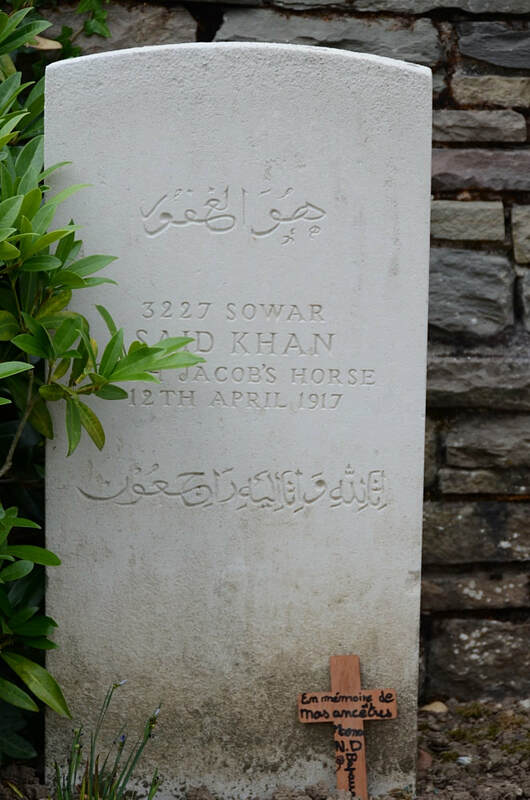 10th April 1917, aged 24. Son of John and Louisa Gray, of Fern Tree, Tasmania. 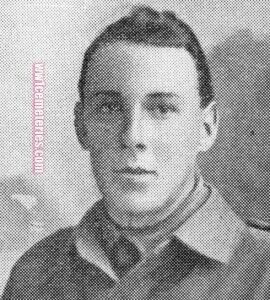 Gnr Hastings enlisted in Melbourne on 5 January 1916 and embarked on 4 May 1916 to join the artillery training school in Tel el Kebir. 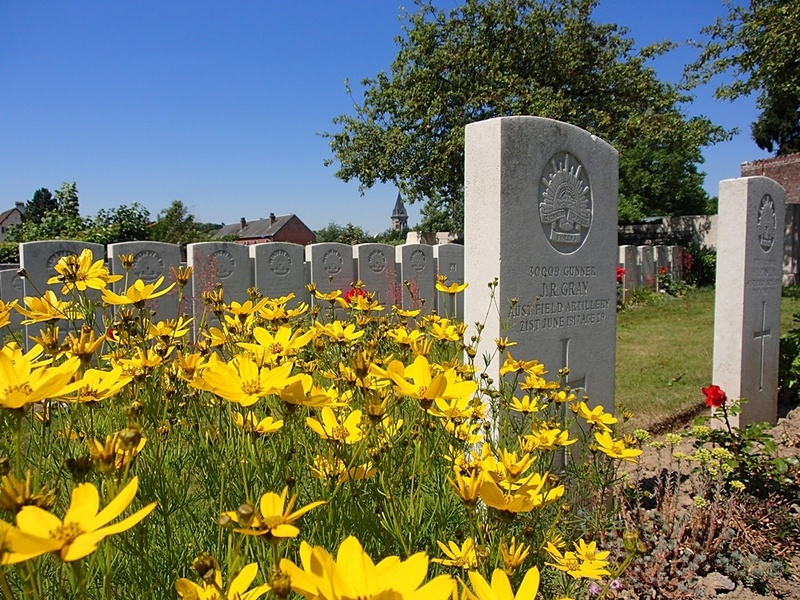 He was killed in action on 8 June 1917 in France. 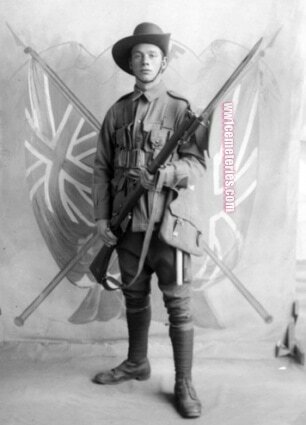 Son of Thomas and Ellen J. Holland, of Jervois Avenue, New Hindmarsh, South Australia. 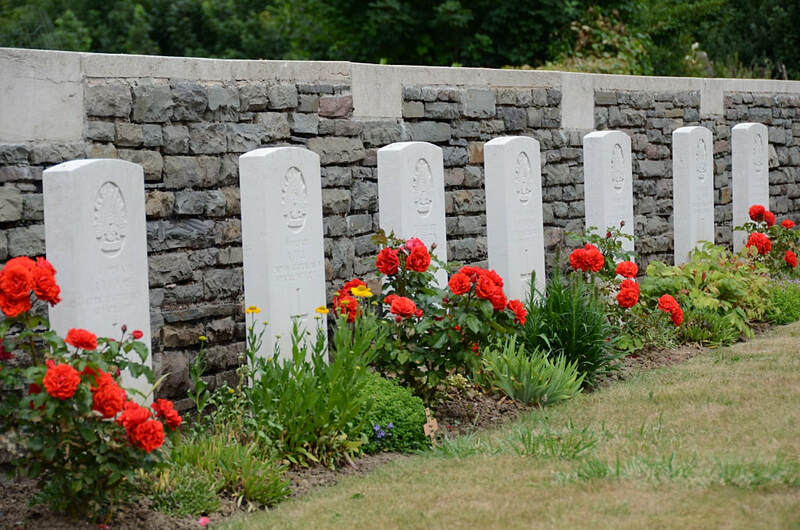 Sgt Holland was wounded in action during the attack on Noreuil on 2 April 1917, died of these wounds later that day. Son of Adam Mann, of Broadcroft, Banff, Scotland. 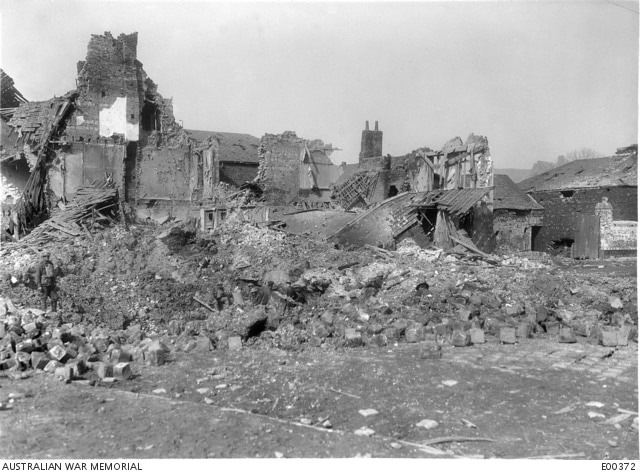 A native of Broadcroft, Banff, Scotland, and working as a carpenter in Adelaide, South Australia, prior to enlistment, he embarked with the 5th Reinforcements on 20 April 1915 aboard HMAT Hororata (A20) for Suez. Pte Mann joined his battalion at Gallipoli on 8 July 1915, was wounded in action a month later and evacuated to Cairo for treatment and recuperation. 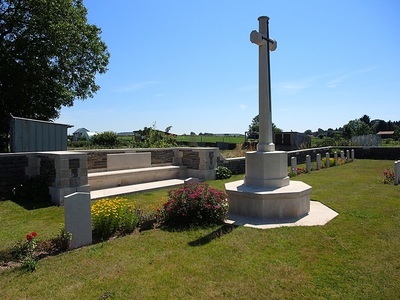 He rejoined his unit in late November 1915 until the battalion was withdrawn to Egypt on 29 December 1915. 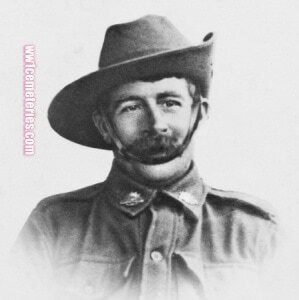 On 26 February 1916 he was transferred to the 50th Battalion which relocated to the Western Front, France, during June 1916. He was hospitalised due to illness from mid-August until late October. Pte Mann was appointed Lance Corporal (L Cpl) on 15 December 1916. 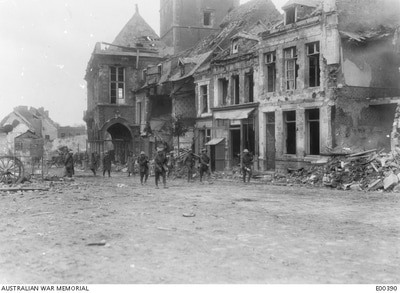 L Cpl Mann was wounded in action during the attack on Noreuil on 2 April 1917 and died of these wounds later that day in the 13th Australian Field Ambulance. He was aged 27 years. A tailor prior to enlisting, he embarked from Sydney aboard HMAT Medic (A7) on 30 December 1915. He was wounded in action on 9 April 1917 near Velu, France. Later that day, he died of his wounds at the 3rd Australian Casualty Clearing Station, France, aged 23. 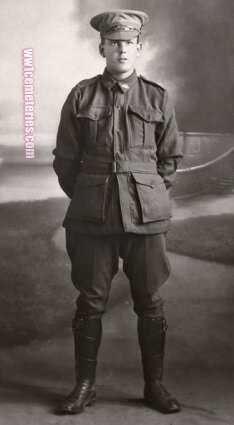 Husband of Gertrude Sheils, of O'Connell St., North Parramatta, New South Wales. From Harris Park, NSW, brother of 9465 Sergeant Leslie Thomas Sheils (killed in action on 13 July 1918 and buried at Frechencourt Communal Cemetery.) 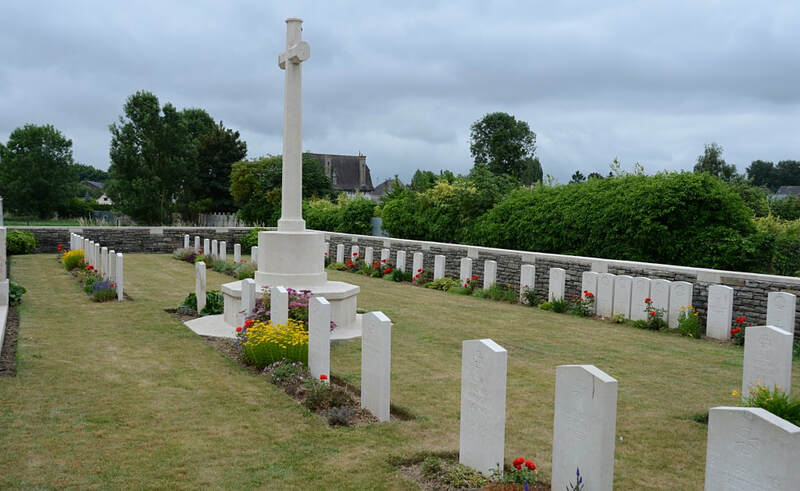 Edward was a labourer prior to enlisting, he embarked from Sydney aboard the HMAT Euripides (A14) on 9 September 1916. 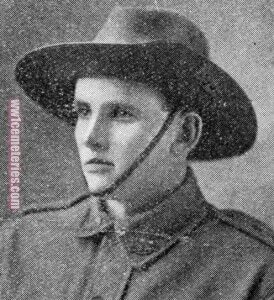 He was wounded in action on 9 April 1917 near Fremicourt, France, and died of his wounds at the 3rd Australian Casualty Clearing Station, France on 10 April 1917, aged 24. Son of James Beattie Sturrock and Charlotte Elizabeth Sturrock, of 45, Woodside Avenue, South Norwood, London, England. Son of John Burnet Watson, of 10, Montreaux Flats, Commercial Parade, Manly, New South Wales, and the late Emily Watson. Native of Burwood, Sydney. 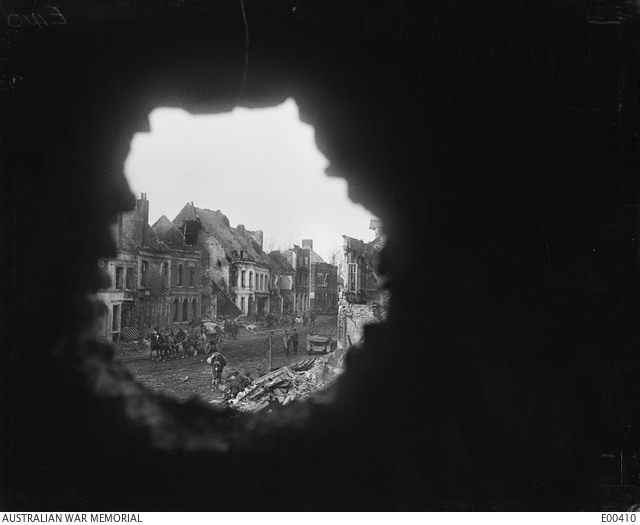 March 1917: A view through a shell hole in a house in the main square, of the ruins of Bapaume. Note the horse and wagon on the left and the horse and soldiers in the foreground.